Interstate 29 serves the Upper Midwest and Great Plains region between Kansas City and Winnipeg, Manitoba, Canada. The freeway parallels the Missouri River between Kansas City and Sioux City, Iowa before straightening out along a northerly heading to Sioux Falls, South Dakota and Fargo, North Dakota. The southernmost 5.5 miles of Interstate 29 double along side I-35 north from the Alphabet Loop encircling Downtown Kansas City. I-35 branches eastward to Claycomo and Liberty while I-29 turns west toward Kansas City International Airport (MCI) and a short overlap along side I-435, the Kansas City Beltway. Leaving the Kansas City area, I-29 bee lines north along low rolling hills to St. Joseph, where an urban loop, I-229 serves Downtown while I-29 bypasses the city to the east. U.S. 71 leaves the I-29 corridor north of St. Joseph while I-29 bends northwest to Mound City and southwest Iowa parallel to the Missouri River. While never entering the state of Nebraska, bridges across the Missouri join the I-29 corridor with Nebraska City and Plattsmouth on the northern drive to Council Bluffs. Once in Council Bluffs, I-29 takes a dog leg along side I-80 west before making an ess curve northward to Interstate 680. I-680 (former I-80N) combines with Interstate 29 for ten miles to Loveland. Migrating westward again toward the Missouri River, I-29 traverses flat areas while en route to Sioux City. The freeway hugs the east banks of the river by Downtown, with I-129 providing a western link to South Sioux City, Nebraska. Just north of there, I-29 crosses into South Dakota. Interstate 29 turns again at Junction City for the trek to Sioux Falls in southeastern South Dakota. I-229 forms an urban loop east to Downtown while I-29 stays to the west through suburban areas between Tea and Renner. A few east and west shifts occur along the route between Sioux Falls and Brookings, home of South Dakota State University. Interstate 29 at U.S. 12 near Summit, South Dakota. The drive north from Watertown to Sisseton traverses hilly terrain punctuated by glacial lakes along the Coteau des Prairies plateau. Photo taken 06/17/15. Traveler services decrease in frequency as I-29 advances from Brookings north northwest to Watertown. The long exit less stretches and generous sight lines justify the 80 mile per hour speed limits along the freeway to the North Dakota state line. The landscape remains similar through southeastern North Dakota. Fargo, the largest city in North Dakota, seen traffic counts increase to 53,445 vehicles per day (vpd) in 2014, as I-29 transitions from rural to suburban and urban settings. 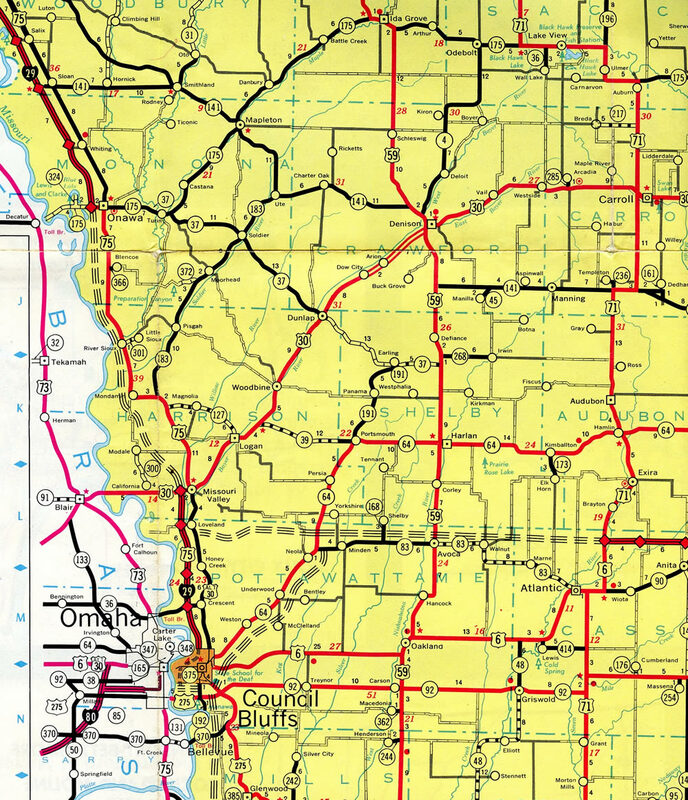 North of the metropolitan area, the rural freeway reduces to 13,110 vpd, and only increases to 14,300 vpd through Grand Forks, the last city of significance along the route. Traffic counts along I-29 trickle to below 5,000 vpd beyond Drayton and just 2,915 at the Canadian border north of Pembina. Construction through 2022 rebuilds Interstate 29 from south of Council Bluffs and the Iowa 92 interchange to north Council Bluffs ahead of 25th Street. Work modernizes the 1960s-era freeway to eliminate left-hand ramps, separate the overlap with Interstate 80 into a dual freeway, and add capacity. The Council Bluffs Interstate System Needs Study by the city of Council Bluffs and the Metropolitan Area Planning Agency between 1997 and 1999 determined that the current I-29 was outdated, did not meet modern design standards or operational criteria and was over capacity. Iowa DOT started the Council Bluffs Interstate System Improvement Program in 2002 to address the issues raised by the study. Initial work commenced in 2006 with a lane addition along the concurrent I-29 south & 80 east section. Major work is now underway involving the redesign of the West System Interchange, where Interstates 29 and 80 merge just east of the Missouri River and the East System Interchange, where the two split for Des Moines and St. Joseph respectively. Construction at the West System Interchange runs through July 2017, while efforts at the East System Interchange continue through September 2019. A revamp of the overlap between Interstates 29 and 80 separates both routes into a dual, divided freeway. This will eliminate weaving traffic patterns. Additional construction improves the geometry of the interchanges with Nebraska Avenue (Exit 52), South Expressway Street (Exit 3) and Iowa 92 (Exit 47). Future construction addresses the West Broadway Interchange with Interstate 480 to replace left-hand ramps along Interstate 29 northbound, add access to U.S. 6 (Broadway) and potentially add new ramps to 2nd Avenue. This work is projected to run from 2020 to 2024. Upgrades to the freeway through Sioux City, Iowa are underway through 2019 as part of the I-29 Improvement Project. Split into three segments, construction along Segment 1 commenced in August 2010, with work on Segment 3, a reconstruction of the northbound lanes to the South Dakota state line, completed in 2012. This phase included six-laning the freeway and improving ramps at the interchanges with Singing Hills Boulevard and Interstate 129. Segment 2 started in spring 2012. It entails widening I-29 to six overall lanes and upgrading several interchanges through the Downtown area. Opened in August 1954, the Paseo Bridge carried Interstates 29 & 35 over the Missouri River north of Downtown Kansas City, Missouri until 2010. 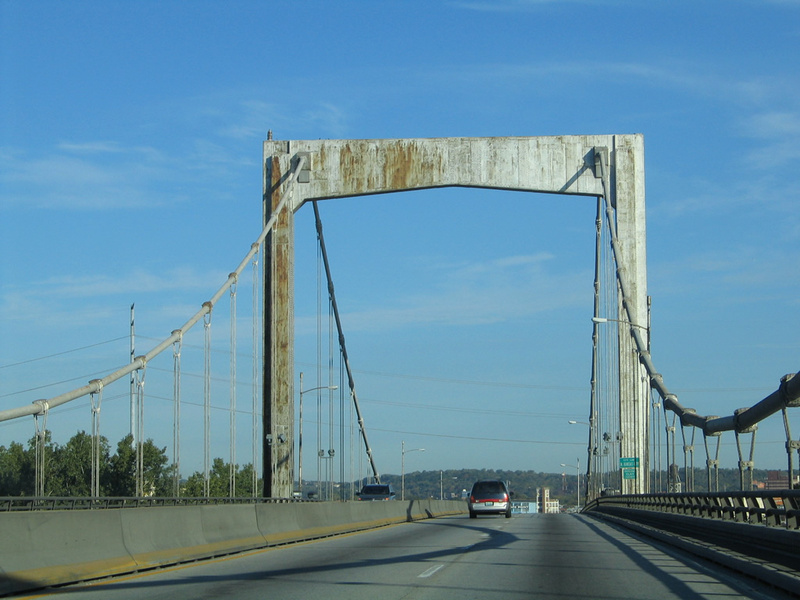 Opening that year was the Christopher S. Bond Bridge, a seven lane wide cable stay bridge. Photo taken 10/17/04. 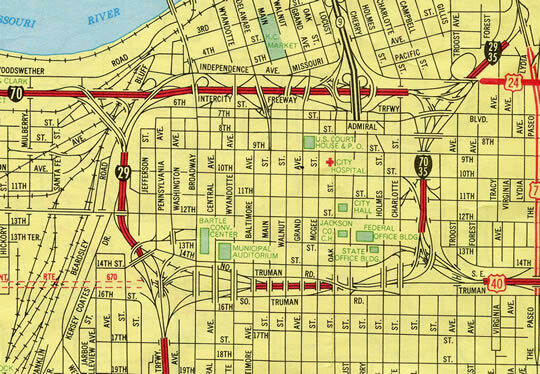 The North Midtown Freeway was completed by 1958 from the Intercity Viaduct (U.S. 24-40-73) to Armour Road (former Missouri 10) and north to the split of Interstates 29 and 35 by 1961. 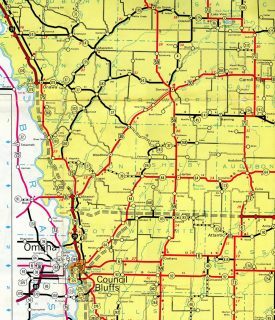 The oldest sections of Interstate 29 were the sections from Council Bluffs to Missouri Valley and from Onawa to the South Dakota state line. Both were completed by 1961. 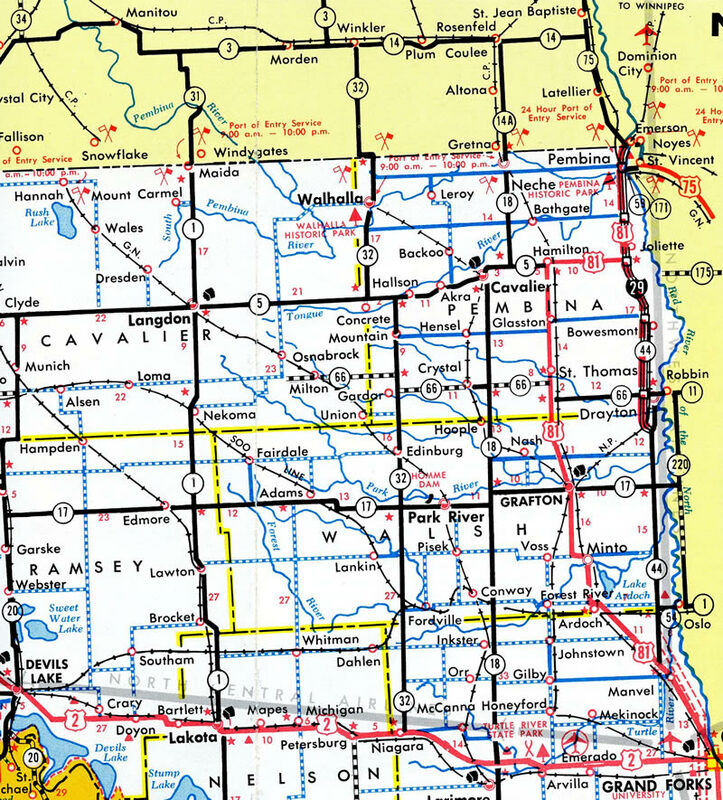 Interstate 29 directly overlays most of U.S. 81 from the South Dakota state line to the International border. Business loops through Grand Forks and Fargo are either signed as U.S. 81 or U.S. 81 Business. The portion north of Exit 203 remains co-signed as I-29 &amp; U.S. 81. The Paseo Bridge, the original suspension bridge carrying Interstates 29 & 35 across the Missouri River in Kansas City, was built as part of a master plan to upgrade both the U.S. 71 and 69 corridors into freeways leading into Downtown Kansas City. The span was conceptualized in 1949 as part of a City Plan Commission study. It was constructed in 1951-1952 and dedicated as U.S. 69 Alternate in August 1954 as a toll facility.5 Toll collection was retired once the bonds were paid off. Interstate 29 previously extended further in Downtown Kansas City, running along the north and west legs of the Alphabet Loop. 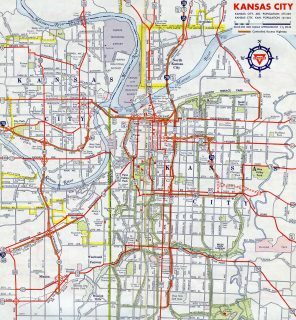 Changes were proposed by Missouri to AASHTO on November 15, 1975, which conditionally approved a relocation of I-35 from the east and south legs of the downtown loop to replace I-29. The south leg was also proposed to be redesignated as an extension of Interstate 670. Action on that request was deferred but the approval of the I-35 relocation was made by AASHTO on November 12, 1976. The KcICON project10 upgraded 4.7 miles of I-29 & 35 from I-70 northward to Missouri 210 (Exit 6). The $245 million project included the replacement of the aging Paseo Bridge and revisions to interchanges with The Paseo, Front Street and Armour Road among others. 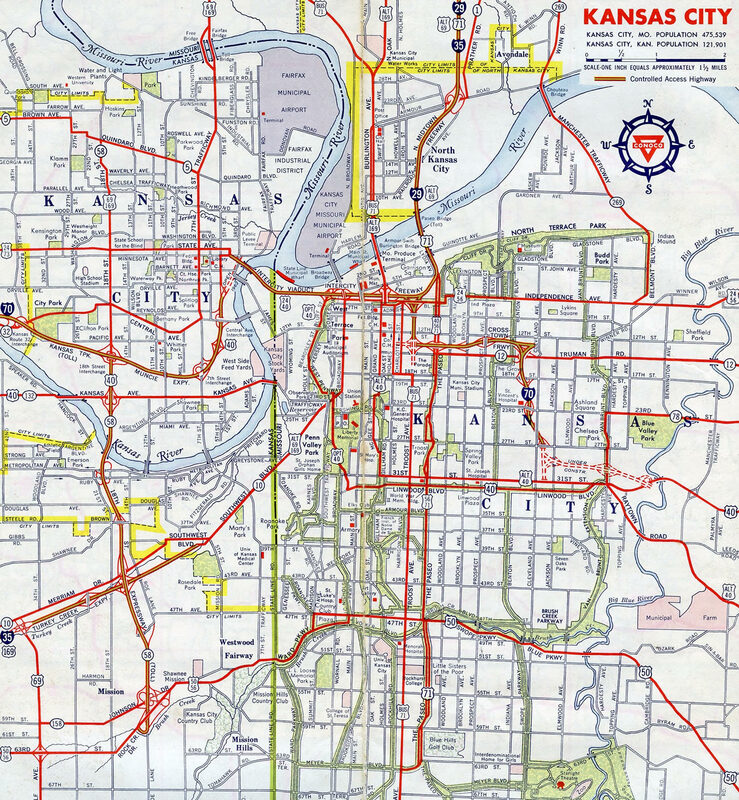 Overall work ran from March 2008 to February 2011. The new cable-stayed bridge across the Missouri River, the Christopher S. Bond Bridge, was dedicated on September 27, 2010. 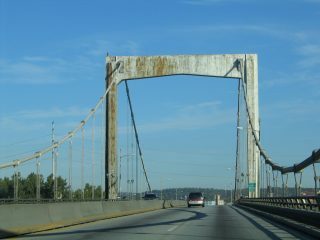 Dismantling of the old bridge followed through 2011. Exit 83 / South Dakota 38 – The wye interchange with a left-hand ramp from southbound to South Dakota 38 (Russell Street) was removed. Exit 82 / Benson Road – A Single Point Urban Interchange (SPUI) was constructed at Benson Road. Exit 81 / Maple Street – The half diamond interchange with Maple Street was upgraded into a six-ramp parclo interchange, offsetting the removal of ramps at the former wye to the north. Entering the final mile of Interstate 29 north leading to the Canadian Port of Entry. Photo taken 06/16/15. A northbound wayside provides access to the Dumolin Church historical site just prior to the border inspection station. Photo taken 06/16/15. Read about the site at the AARoads Blog. A duty free store resides just south of the Canadian border along the left-hand side of Interstate 29. A paved loop circles in front of the location prior to the port of entry. Photo taken 06/16/15. The inspections and customs requirements vary for different types of vehicles. The port of entry beyond I-29’s end specifies commercial truck traffic move to the right. While traffic counts are light north of Grand Forks, trucks make up a large percentage of the volume. Photo taken 06/16/15. Speed limits gradually reduce from 75 to 60, 45 and 25 miles per hour as motorists approach the queue into Canada. The border patrol station comes into view to the left beyond an adjacent truck parking area. Photo taken 06/16/15. Interstate 29 (and U.S. 81) comes to an end as motorists reach the truck parking area. A second left-hand turn follows for the customs and border protection information parking area and a service road back southbound to I-29 & U.S. 81. Photo taken 06/16/15. A third turn-off follows for the duty free shop as the Canadian customs station comes into view. Beyond customs, the roadway transitions to Provincial Trunk Highway 75. PTH 75 is a continuation of U.S. 75, which until 2006, crossed into Emerson, Manitoba from Noyes, Minnesota east of the Red River. Photo taken by Rich Piehl (07/06/02). As is common at border crossings, this sign (replaced by 2007 with a standard green and white panel) showed the last U-turn available for the United States. However it is unclear if drivers using this turnaround are required to pass through the border inspection station. Instead travelers headed back south should turn around at the previous parking area turn-off. Photo taken by Rich Piehl (07/06/02). The 49th Parallel marker is the official demarcation between the United States and Canada. This sign stands just beyond the last turnaround for the U.S. Photo taken by Jim Teresco (06/09/01). This overhead sign (replaced by 2012) at Provincial Road 243 west was the first appearance of an Interstate 29 shield posted along Provincial Trunk Highway 75 south. The international border lies a short distance ahead. Photo taken by Jeff Morrison (05/10/07). Provincial Trunk Highway 75 used to branch east from its expressway just north of the U.S. port of entry. It connected with Provincial Road 200 (Main Street) in Emerson. This alignment was dropped once the border station at Noyes, Minnesota was permanently closed in 2006. As a result PR 200 was extended westward over the former PTH 75. This set of overheads was replaced by 2012 and PTH 75 was replaced with PR 200 on the left-hand panel while the reference to I-29 was replaced with a U.S. Customs lane allocation sign. Photo taken by Jeff Morrison (05/10/07). A PTH 29 marker was posted along PR 200 (former PTH 75) west ahead of the expressway linking the south end of PTH 75 with the north end of Interstate 29. 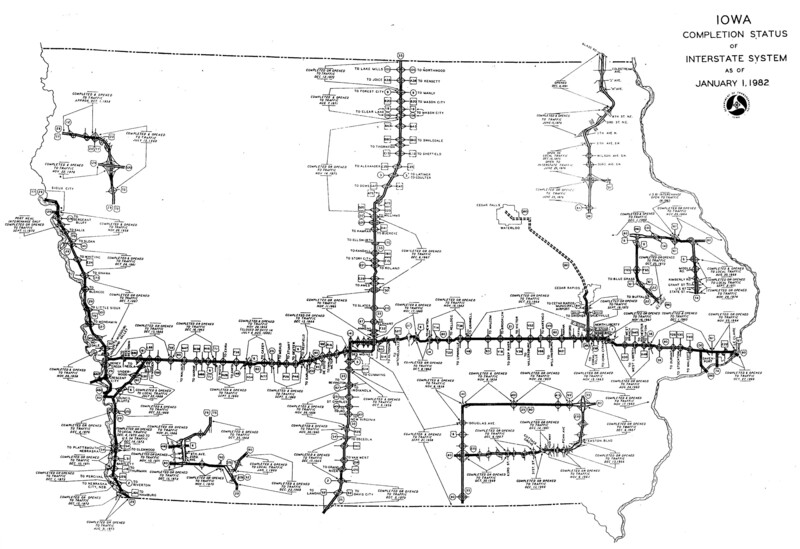 This was changed by 2012 to reflect the realignment of PTH 75 south to North Dakota. Photo taken by Jeff Morrison (05/10/07). This shield assembly directs motorists at the west end of PR 200 (former PTH 75) onto PTH 75 north toward Winnipeg and the border station south to Interstate 29. Photo taken by Jeff Morrison (05/10/07). A connector provides access from the border station service road back to the northbound lanes leading into Manitoba. Visible to the left is the northbound truck parking area. Photo taken 06/16/15. A monument appears between the service road and the Interstate 29 lanes exiting the U.S. port of entry. Photo taken 06/16/15. Motorists exiting the inspection lanes may also turn around back toward Canada. All traffic otherwise continues southward toward Pembina. Photo taken 06/16/15. Just south of the border station is the first reassurance shield assembly for Interstate 29 and U.S. 81. Photo taken by Jeff Morrison (05/10/07). A Pembina County line sign (since replaced with a Clearview-font based panel) lies just south of the first I-29 shield. The first exit is for the small city of Pembina. Interstate 29 otherwise continues southward, with U.S. 81 splitting at Exit 203 and rejoining the freeway north of Grand Forks. Photo taken by Jeff Morrison (05/10/07). Eastbound North Dakota 59 meets Interstate 29 and U.S. 81 at a diamond interchange on the west side of Pembina. I-29 & U.S. 81 proceed 2.3 miles further north. This is significant in that other border Interstates see interchanges much closer to the international boundary. North Dakota 59 east otherwise becomes Minnesota 171 east, a short connector to U.S. 75 south of Noyes. This sign was replaced by 2015. Photo taken by Jeff Morrison (05/10/07). Interstates 29 & 39 south approach the Christopher S. Bond Bridge across the Missouri River, 1.75 miles ahead of Interstate 70 and the Alphabet Loop encircling Downtown Kansas City. Photo taken 06/18/15. The seven lane cabled-stayed bridge across the Missouri River takes Interstates 29-35 & U.S. 71 south to a single point urban interchange (SPUI) with Front Street. The KcICON project between 2008 and 2011 upgraded 4.7 miles of the freeway from Missouri 210 (Armour Road) south to Interstate 70. Photo taken 06/18/15. A left-hand ramp branches away from Interstates 29 & 35 south for The Paseo as the freeway veers southwest to the three wye interchange (Exit 3) with Interstate 70 & U.S. 40. Photo taken 06/18/15. Arrow per lane signs guide motorists to the Alphabet Loop. Interstate 70 follows the north and east legs of the downtown loop. I-35 overlaps with I-70 to the west leg. U.S. 40 travels wholly along Interstate 70 as well. Photo taken 06/18/15. U.S. 71 extends along Interstate 70 east to its own freeway south to Midtown Kansas City. Interstate 70 turns east from the downtown loop to Parkview and Independence Plaza en route to Columbia and St. Louis while westbound continues to Kansas City, Kansas and Topeka. Photo taken 06/18/15. The formal end sign for Interstate 29 appears as Interstate 35 south merges with I-70 & U.S. 40 west ahead of the Charlotte Street underpass and Exit 2F to the River Market area. Photo taken 06/18/15. Traveling south along the old Paseo Bridge, Interstates 29 & 35 carried just three lanes to the lane drop for the left exit with The Paseo. Photo taken 10/17/04. I-29 exit mileage actually begins after Interstates 29 and 35 split, but the official southern terminus is at Interstate 70, 5.5 miles south of their merge. An end sign was posted previously ahead of the wye interchange (Exit 4A) for The Paseo. Photo taken 10/17/04. The KcICON project expanded Interstates 29 & 35 south to four lanes at the separation with The Paseo (Exit 4A). The left-hand off-ramp was retained, but the adjacent left-hand on-ramp was shifted to the right side of northbound. Photo taken 10/17/04. 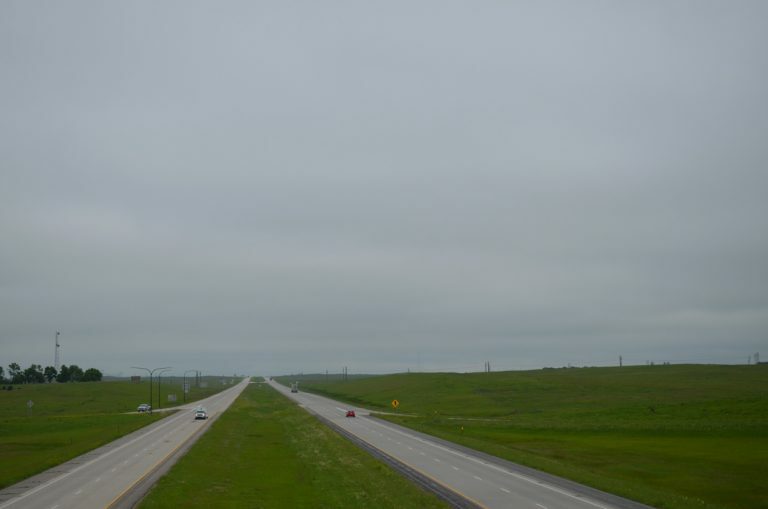 Construction expanded Interstate 35 to six overall lanes to the southern terminus of I-29. APL signs replaced these signs. U.S. 24 is no longer referenced for I-70 east, but U.S. 40 is. Photo taken 10/17/04. Previously single lane ramps facilitated movement from I-29 & 35 south onto the downtown loop. I-70 & U.S. 71 travel along the east leg by Paseo West while I-35 merges with I-70 & U.S. 24-40 west by River Market. Photo taken 10/17/04. Ramps from Interstate 670 east and U.S. 71 north come together and merge with I-70 & U.S. 40 at the 11th Street underpass, just one quarter mile south of the three wye interchange (Exit 2G) with Interstate 29 & 35 north. U.S. 71 uses the east leg of the downtown loop from Hospital Hill to continue north along I-29 & 35 to the Columbus Park Industrial area. Photo taken 06/18/15. The east leg of the Alphabet Loop defaults onto Interstates 29 & 35 north to North Kansas City while a single lane ramp departs from the left to I-70 & U.S. 24-40 to Kansas City, Kansas. U.S. 24 lines the north leg of the Alphabet Loop to Independence Avenue and Kessler Park. Photo taken 06/18/15. Interstate 29 north begins as I-35 parts ways with I-70 east for a 5.5 mile overlap. I-29 connects Kansas City with St. Joseph and Omaha while I-35 travels to Des Moines and the Twin Cities. Photo taken 06/18/15. A pair of button copy signs previously posted at the 10th Street overpass outlined the back to back off-ramps for Admiral Boulevard and Interstates 29 & 35 north. Photo taken 10/17/04. The diagrammatic sign along I-70 & U.S. 40 west at 10th Street posted with button copy Interstate shields. Photo taken by Michael Summa (1982). Another set of damaged signs directed motorists onto Exit 2H for the continuation of U.S. 24 east from the downtown loop and Exit 2G, where I-35 south merges with I-70 west. Photo taken 10/17/04. Interstate 70 & U.S. 40 west at the split with Exit 2G for I-29-35 & U.S. 71 north. These signs were replaced by 2011 when the left-hand ramp was restriped from two lane to one. Photo taken 10/17/04. Interstate 35 north and I-70 & U.S. 40 east combine just over a half mile ahead of their split at the northbound beginning of Interstate 29 (Exit 2G). A series of on and off-ramps line the north leg of the Alphabet Loop between Broadway Boulevard and Missouri 9 (Exit 2E). Photo taken 06/19/15. Four guide signs line up along the Walnut Street overpass ahead of the pending split of I-70 & U.S. 40 with Interstate 35 and U.S. 24. Missouri 9 begins and travels north across the Heart of America Bridge via Exit 2E. Photo taken 06/19/15. Interstate 70 & U.S. 40 east turn southward with U.S. 71 onto the east leg of the downtown loop along a single lane ramp as the north leg mainline defaults onto Interstates 29 & 35-U.S. 71 north via Exit 2G. Photo taken 06/19/15. Interstate 29 combines with I-35 northward from I-70 for route continuity purposes for travelers headed north to St. Joseph or Council Bluffs, Iowa. The two routes serve an industrial area along the Missouri River before splitting at the Crestview neighborhood of Kansas City. Photo taken 06/19/15. Immediately beyond the Exit 2G gore point, U.S. 24 east departs from I-70 & U.S. 40 at Exit 2H for Independence Avenue to Kessler Park and Parkview. A single lane ramp takes drivers along I-29 & 35 north to the merge with the ramp from I-70 west & U.S. 71 north. Photo taken 10/17/04. A sign change was made at Exit 2G by 2007 when the Interstate 70 mainline turn from the north leg to the east leg of the downtown loop was restriped to a single lane. Photo taken 10/17/04. The first reassurance marker for Interstate 29 appears along side I-35 & U.S. 71 ahead of the wye interchange with The Paseo north. The adjacent on-ramp merged onto the left-hand side of the freeway until the KcICON Project of 2008-11. Photo taken 06/18/15. 2.3 miles north of the Christopher S. Bond Bridge, Interstates 29 and 35 split at a three wye interchange (Exit 8B). I-29 & U.S. 71 turn northwesterly and mirror the course of the Missouri River to St. Joseph. I-35 curves northeast to double as the Chicago Kansas City Expressway (CKC / MO 110) to Cameron. Photo taken 06/18/15. Exit 8A departs for Parvin Road to Crestview and Colonial Square as the three lanes of I-29 & 35 north prepare to separate. Exit numbers from I-35 do not carry over along I-29 north. Photo taken 10/17/04. Interstate 29 & U.S. 71 continue north to an overlap with I-435 by Kansas City International Airport (KCI). U.S. 71 remains paired with the freeway to Exit 56 north of St. Joseph. Photo taken 06/18/15. 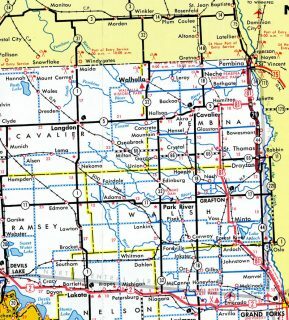 “The Dwight D. Eisenhower System of Interstate and Defense Highways – Part I – History.” FHWA web site. 29 Russell. http://www.29-russell.com/ South Dakota Department of Transportation project web site. I-29 Fargo: Project Details. http://www.i29fargo.com/project/ ND Department of Transportation project web site. Background – I-29 Improvement Project web site. Page updated July 22, 2016.